Author note: This is the first article in a 3-part series. 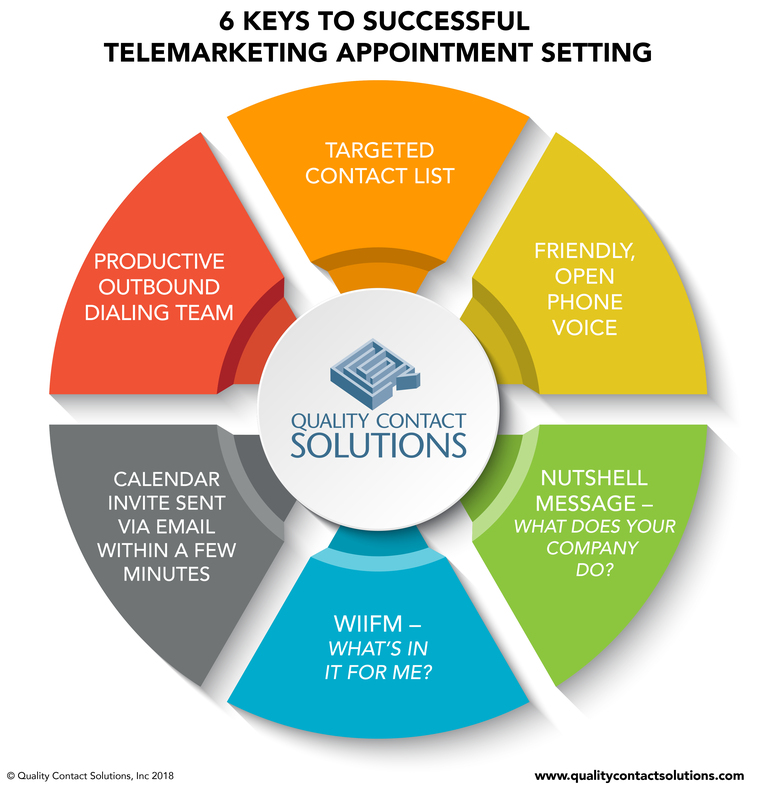 If any of these core components are not optimized, then your telemarketing appointment setting program will not produce the highest Return on Investment (ROI) possible. Telemarketing appointment setting requires tenacity and creativity. The tenacity is having the will power to make hundreds of phone calls a day, resulting in a handful of appointments. The creativity is identifying what works and what is not working – to come up with the best approach to secure more appointments that are kept. In this first article in a 3-part series, I’ll cover the concept of Appointment Kept Rate and what you can do to ensure the highest appointment kept rate possible. The Appointment Kept Rate is the percentage of appointments that are kept (not cancelled or no-showed) by your prospect divided by the total number of appointments set for the period of time that you’re measuring. For example, if your outbound telemarketing appointment setting team set 500 appointments last month and 300 appointments were kept (including those that were rescheduled), your appointment kept rate is 60%. That’s a pretty good rate. 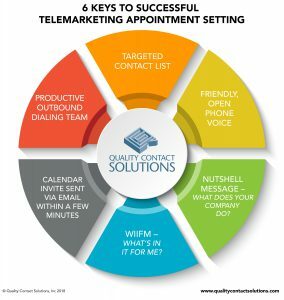 As an outsourced telemarketing appointment setting resource, our company works with many clients in many different industries and we find that the methodology of getting a high appointment kept % is relatively simple. The first critical component for a high appointment kept rate is making sure that the prospect is told very clearly WIIFM (what’s in it for me). Some people agree to appointments because they don’t like conflict or don’t like saying “no”. So they agree to the appointment but don’t honor the commitment because it is easier to say yes and then not show up. Make sure that you reinforce with your appointment confirmation (wrap-up) verbiage what your prospect will gain by attending the appointment and if you can’t put that in one or two sentences you need to work on creating an effective nutshell message. Next, be sure you send a calendar invite immediately following the telemarketing call to lock in the appointment time on your prospect’s calendar. It is best if you can get access to the salespeople’s calendars and set the appointments on their calendar on their behalf, inviting the prospect to the appointment. In the calendar invite, the nutshell language should also be included in the appointment notes or comments to reinforce why it is worth them keeping the appointment. Another nice touch is to send an email from the appointment setter to the prospect (cc to the salesperson that the appointment is set for) thanking them for their time and letting them know that they should have received a calendar invite and ask them to PLEASE accept the appointment to lock in the time. If you set appointments too far in advance, expect a high rate of no-shows or reschedules. As a rule of thumb, we limit our outbound telemarketing appointment setters to set appointments no more than one week from the date of the call. If the prospect insists that they can’t do an appointment sooner (out of the office, etc. ), then set a callback to set the appointment, don’t set the appointment and hope for the best. In the next 2 articles on this topic, I’ll share best practices for finding a good prospect list and best practices for writing an appointment setting script. This entry was posted in Articles and tagged Appointment Setting, B to B Telemarketing on September 5, 2018 by .